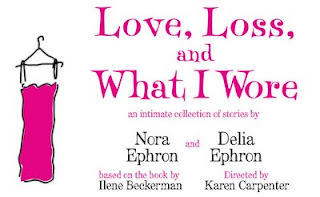 Love, Loss and What I Wore is a series of connected tales by sisters Nora Ephron and Delia Ephron. These stories, inspired by Ilene Beckerman's little picture book as well as some of their own and their friends, are the stories of grandmothers, mothers, aunts, daughters, sisters, and friends. Centered around the clothes and accessories that we all love or loathe and the memories they invoke, the tales induce much laughter and a few tears. The show, directed by Karen Carpenter and featuring five actresses of varying ages, is a nicely produced, but staged reading. The cast rotates every few weeks. I can imagine that actresses all over the city will be lining up around the block for a chance to join this reading. The first cast was comprised of Samantha Bee, Tyne Daly Katie Finneran, Natasha Lyonne and Rosie O'Donnell. I saw the current cast, with Mary Birdson, Tyne Daly, Lisa Joyce, Jane Lynch, and Mary Louise Wilson, twice. They are on through this weekend. I laughed so hard over Tyne's reading of Nora Ephron's essay, "I Hate My Purse", I practically had an asthma attack. If you know me at all, you know purses are the bane of my existence! On November 18th through December 13th, Kristen Chenoweth, Captathia Jekins, Rita Wilson, Rhea Perlman and her daughter Lucy DeVito take over. The cast changes again on December 16th. Mary Louise Wilson resumes her role and is joined by Lucy DeVito, Katie Finneran, Capathia Jenkins, and Natasha Lyonne. The show breaks for the Christmas and Hannukah holidays, but resumes in the New Year on January 6th with Michele Lee, Debra Monk, Tracee Ellis Ross, Casey Wilson and Katie Finneran. I will definitely go back to see this cast. Love, Loss and What I Wore has extended through the end of March, but there's no word who will take over after January 31st. The Westside Theatre is at 407 West 43rd, between 9th & 10th Avenues. Tickets are available via Telecharge. A portion of ticket sales goes to benefit Dress For Success. Donations of nearly-new purses and professional totes are welcome and will be collected in the lobby prior to each performance. I'll be there next month and I'm really looking forward to it! Saw it, enjoyed it moderately. I guess I just couldn't relate all that well to clothing and purses. I did really enjoy the cast especially Mary Birdsong, Jane Lynch and Mary Louis Wilson!